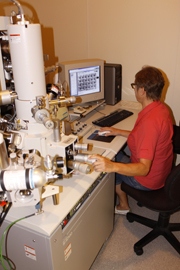 The core instruments of the Electron Microscope Facility are the Hitachi S-4700 Field Emission Scanning Electron Microscope (SEM) with Quorum Technologies Cryo-system, and the Philips CM30 High Resolution Transmission Electron Microscope (TEM). Both have x-ray analytical capability for elemental analysis. 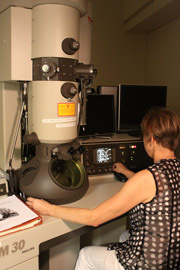 The Hitachi S-4700 is a cold field emission high resolution scanning electron microscope. Capabilities include secondary electron (SE) and backscattered electron (BSE) imaging. It is equipped with an energy dispersive x-ray system which allows both qualitative and quantitative elemental analysis. The Quorum Technologies PP2000T system allows the examination of hydrated samples. 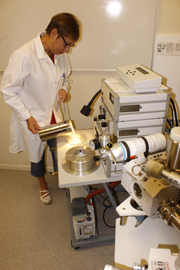 A sample can be rapidly frozen before being transferred under vacuum into the SEM for observation. The Philips CM30 is an ultra-high resolution transmission electron microscope with a LaB6 source. It is also equipped with and energy dispersive x-ray system for elemental analysis. Make an enquiry of the Microscopy@Waikato staff. Find out about Waikato's biological imaging facilities. Heart, cochlear, spinal-cord and deep-brain stimulators all deliver therapeutic stimuli through electrodes implanted in the human body.